Discover if Your Car is a Lemon or Not! You do have rights if you think you have purchased a lemon. You should know what your rights are and you should know if you really do have a lemon. The views of a lemon are different in every state. You should find out what your state says about your car and if it constitutes under the lemon law. There are state laws and federal laws that protect the consumer from automobile fraud and from being sold a lemon. You might think you have a lemon and you don’t. Know what constitutes as a lemon. You might have enough defects in your car that constitute it as being a lemon. Did you know that even though the car is drivable it may still be a lemon. There are many factors you should consider if you have a lemon and if you can do something about it. Every state is different and depending on the amount of repair attempts you may have already done for your car it may be considered a lemon. The laws are on your side. No one has to settle for a lemon or a vehicle that doesn't run. A vehicle is a very expensive investment and you have to protect yourself and your property. There is something you can do. You may be able to revoke your purchase also. Find out what you can do with the 'How to Know if Your Car is a Lemon or Not'. Your lemon can be returned, replaced, or refunded to you. Find out what your rights are with this amazing handbook packed with information about what you can do with your investment. Protect yourself and your investment. 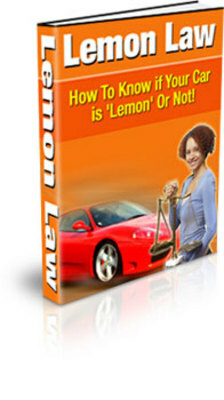 Car Lemon Law automobile lemon law;car lemon law 93888916 13.95 valuebooks Fresh Download Available!